The Rendlesham Forest Incident is the name given to a series of reported sightings of unexplained lights and the alleged landing of a craft of unknown origin in Rendlesham Forest, Suffolk, England in late December 1980. Some Ufologists believe it is perhaps the most famous UFO event to have happened in Britain, ranking amongst the best-known UFO events worldwide. It has been compared to the Roswell UFO incident in the United States and is sometimes referred to as “Britain’s Roswell”. Following the event, the Ministry of Defence (MoD) denied that it posed any threat to national security and stated that it was therefore never investigated as a security matter. Later evidence indicated that there was a substantial MoD file on the subject and this led to claims of a cover-up. Some interpreted this as part of a larger pattern of information suppression concerning the true nature of unidentified flying objects, by both the United States and British governments (see the UFO conspiracy theory). However, when the file was released in 2001 it turned out to consist mostly of internal correspondence and responses to inquiries from the public. The lack of any in-depth investigation confirmed that the case was never taken seriously by the MoD. 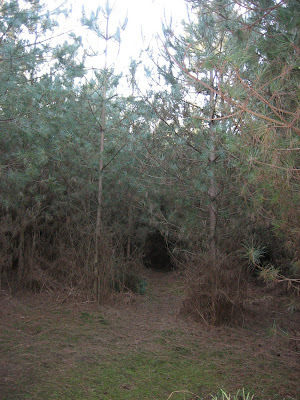 Rendlesham Forest is owned by the Forestry Commission and consists of approximately 15 square kilometres (3700 acres) of coniferous plantations, interspersed with broadleaved belts, heathland and wetland areas. It is located in the county of Suffolk, about eight miles (13 km) to the east of the town of Ipswich. The incident occurred in the vicinity of two military bases (now both abandoned by the USAF). These are RAF Bentwaters, which is situated just to the north of the forest, and RAF Woodbridge which extends into the forest from the west. At the time, both were being used by the United States Air Force (USAF) and were under the command of wing commander Colonel Gordon E. Williams. The base commander was Col Ted Conrad, and his deputy was Lieutenant Colonel Charles I. Halt. It is Halt’s written memo to the Ministry of Defence on the incident, and his personal involvement in the second night of the sightings, that has given the case credibility. 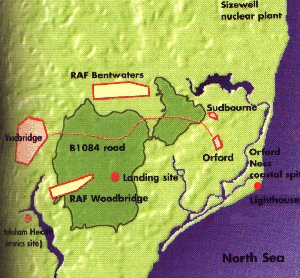 The main events of the incident, including the supposed landing, took place in the forest, almost a mile (1600 m) to the east of the East Gate of RAF Woodbridge. Orford Ness lighthouse, which skeptics identify as the flashing light seen off to the coast by the airmen, is another five miles (8 km) further east of this location. All these locations are shown on the adjacent map. Commentators have published more detailed maps of the location and a modern aerial view of the region can be found on Google Maps. Retired Sgt. John Burroughs (LE) states that the events took place over three successive nights (pm into am); 25th-26th, 26th-27th and 27th–28th December 1980. One of the key pieces of primary evidence—the “Halt memo”, described below—suggests that the first sightings were on the 27th, rather than 26th. However, the memo was written almost two weeks after the event and its author later agreed that he had probably made a mistake in his recollection of the dates. This discrepancy in dates has not only confused subsequent researchers but also led to confusion at the time, for example in the MoD’s investigation and analysis of contemporaneous radar records. Around 3 a.m. on 26 December 1980 strange lights were reported by a security patrol near the East Gate of RAF Woodbridge. Servicemen initially thought it was a downed aircraft but, upon entering the forest to investigate, they saw many strange lights moving through the trees, as well as a bright light from an unidentified object. Shortly after 4 a.m. local police were called to the scene but reported that the only lights they could see were those from the Orford Ness lighthouse, some miles away on the coast. Some reports claim that local farmyard animals had been behaving in a state of fear and panic, although this was an arable farm and had no animals. 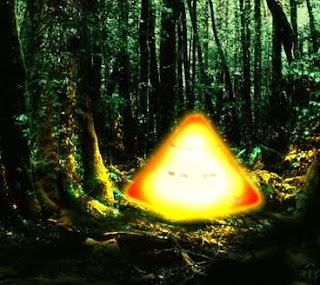 Three servicemen were sent out to investigate and came upon a triangular and brightly lit object silently hovering in the woods several feet off the ground. It was a conical metallic object, suspended in a yellow mist, hovering over a clearing in the trees, with a pulsating blue and red circle of light above. One made detailed notes of its features, touched its “warm” surface, and copied the numerous symbols on its body. The object flew away after their brief encounter. One eyewitness claims to have seen triangular landing gear on the object leaving three impressions in the ground that were visible the next day. The airmen were allegedly debriefed, threatened and ordered to sign documents that vowed silence; one even claimed to have been forced to sign a document claiming the UFO was a lighthouse. Some reports suggest that they were reportedly ordered to stay quiet, with the warning “bullets are cheap”. Lieutenant Colonel Halt, however, claimed in a 2008 interview for U.S. news channel CNN that to this day he has not been debriefed over the incident. After daybreak on the morning of 26 December, servicemen returned to the small clearing where the conical object had been seen, and found three small impressions in a triangular pattern, as well as burn marks and broken branches on nearby trees. Plaster casts of the imprints were taken and have been shown in television documentaries. At 10.30 a.m. the local police were called out again, this time to see the impressions on the ground, which they thought could have been made by an animal. The servicemen returned to the site again in the early hours of 28 December 1980 with radiation detectors, although the significance of the readings they obtained is disputed. The deputy base commander Lt Col Charles I. Halt investigated this sighting personally and recorded the events on a micro-cassette recorder (see “The Halt Tape”, below). The site investigated by Halt was near the eastern edge of the forest, at approximately 52° 05’ 20” N, 1° 26’ 57” E.
It was during this investigation that a flashing light was seen across the field to the east, almost in line with a farmhouse. The first public report of the incident was published in the tabloid newspaper News of the World, on 2 October 1983, beneath the sensational headline UFO lands in Suffolk – and that’s official. The story was based on an account by a former US airman, using the pseudonym Art Wallace (supposedly to protect himself against retribution from the USAF), although his real name was Larry Warren. The first piece of primary evidence to be made available to the public was a memorandum written by the deputy base commander, Lt. Col. Charles I. Halt, to the Ministry of Defence (MOD). Known as the “Halt memo”, this was made available publicly in the United States under the US Freedom of Information Act in 1983. 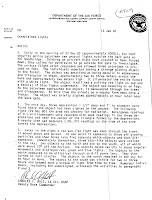 The memorandum (left), was dated “13 Jan 81” and headed “Unexplained Lights”. The two-week delay between the incident and the report might account for errors in dates and times given. The memo was not classified in any way. Picture right: Letter from Lt. Col. Charles Halt. Click to enlarge. The Scottish researcher James Easton succeeded in obtaining the original witness statements made for Col. Halt by Fred A. Buran, 81st Security Police Squadron, Airman First Class John Burroughs, 81st LE, Airman Edward N. Cabansag, 81st Security Police Squadron, Master-Sergeant J. D. Chandler, 81st Security Police Squadron and Staff-Sergeant Jim Penniston, 81st Security Police Squadron. These documents are now in the public domain and scans of them are available on Ian Ridpath’s website. Penniston’s statement is the only one that positively identifies a mechanical object as the source of the lights. He states that he was within 50 metres of the object and “it was defidently mechaniclal in nature” [spelling as in original]. Penniston has shown on television a notebook in which he claims to have made real-time notes and sketches of the object. The notebook is headed with the date 27 December and the time 12:20 (00:20 GMT), which does not accord with the date and time given by the other witnesses for the encounter. In addition, Penniston claims that he saw the object at a different landing site from the one investigated by Halt, much closer to RAF Woodbridge. The witnesses were unnerved by their experience and believed that they had witnessed something, as Buran expresses it, “out of the realm of explanation”. Also, in 1984, a copy of what became known as the “Halt Tape” fell into the hands of researchers. Unfortunately, because of static and the fact that the tape had been dubbed on an old machine, much of its background conversations could not be discerned. The US Sci Fi Channel acquired the original recording, which documents Halt and his patrol investigating a UFO sighting in Rendlesham Forest in December 1980. This tape not only reveals much more of the background conversations but features names that could not be heard on the poor-quality 1984 dub. The tape has also been transcribed by researcher Ian Ridpath, who includes a link to an audio download. Suffolk Constabulary have a record, dated 26 December 1980, of a report from the law Enforcement Desk of RAF Woodbridge, stating that “We have a sighting of some unusual lights in the sky, we have sent some unarmed troops to investigate, we are terming it as a U.F.O. at present”. The police investigated this report and the result is recorded as follows: “Air Traffic Control West Drayton checked. No knowledge of aircraft. Reports received of aerial phenomena over southern England during the night. Only lights visible this area was from Orford light house. Search made of area – negative.” The “aerial phenomena” probably refers to the re-entry of the Russian Cosmos 749 rocket which was widely seen over southern England on the evening of December 25. A letter in the police file notes that one of the PCs returned to the site in daylight in case he had missed something. “There was nothing to be seen and he remains unconvinced that the occurrence was genuine. The immediate area was swept by powerful light beams from a landing beacon at RAF Bentwaters and the Orfordness lighthouse. I know from personal experience that at night, in certain weather and cloud conditions, these beams were very pronounced and certainly caused strange visual effects.” A scan of the report is available at Suffolk Constabulary’s website. Some researchers have claimed that personnel from Porton Down visited Rendlesham in 1980 after the Rendlesham Forest Incident. However, no evidence has been presented and there seems to be confusion with other alleged UFO incidents. In 2001 the British Government released its file on the incident to researchers following a request from Dr David Clarke under the Code of Practice for Access to Government Documents, a precursor to the Freedom of Information Act. The Ministry of Defence has since made these documents available online. However, the United States continues to remain silent despite the SciFi Channel-sponsored investigation entitled “UFO Invasion at Rendlesham”, the History Channel’s “UFO Files – Britain’s Roswell” and Coalition for Freedom of Information inquiries. Jim Penniston and John Burroughs went to investigate the craft together. However, there is a major inconsistency in separate interviews of Jim Penniston and John Burroughs. In an interview with Larry King on November 9, 2007, Jim Penniston claimed that he did a 45 minutes full investigation of the craft on the ground, touched the craft and took photos of the craft. However, in a separate interview in Robert Stack’s Unsolved Mysteries, John Burroughs described that after suddenly encountering the craft on the ground, “we all hit the ground, and it went up into the trees”. The interviews with Jim Penniston and John Burroughs have subsequently been made available on Youtube. Science writer Ian Ridpath investigated the incident in 1983, initially for BBC TV’s Breakfast Time news programme, and on 5 January 1985 wrote an article for The Guardian which did much to discredit the accounts of the UFO sightings at Rendlesham. Ridpath asked local forester Vince Thurkettle about the flashing light, and he indicated that it originated from a nearby lighthouse, which as seen from the forest edge appears to hover slightly above the ground and would appear to move as the witnesses moved. Also, if a UFO was present, the airmen should have reported a second source of light (the lighthouse) in the same line of sight. In the Halt tape (mentioned above), one can hear an unidentified airman call out “There it is again…there it is” with an interval of 5 seconds, the same frequency at which the Orford Ness lighthouse flashes. Video footage of the lighthouse as seen from Col Halt’s vantage point at the edge of the forest shows it flashing at this rate. Thurkettle saw the alleged “landing marks”, as did the local police, and believed them simply to be old “rabbit diggings” covered with pine needles. USAF photographs of the marks discovered by researcher Georgina Bruni were sent to the MoD by Lord Hill-Norton in 2001 and released under the Freedom of Information Act in 2007. Moreover, the supposed burn marks in the trees were actually axe cuts made by foresters that indicated the trees were ready to be felled. To give further pause to accepting the alleged UFO sighting, a meteor “almost as bright as the full Moon” was spotted over southern England at exactly the time of the initial reports of a bright object “landing” in the forest, according to Dr John Mason, who collects reports of meteor sightings for the British Astronomical Association. Crucial amongst the evidence is the interpretation of the levels of radiation in the area (clearly heard on the “Halt tape”). Experts at the UK’s National Radiological Protection Board (NRPB) have pointed out that the equipment used for this measurement was not intended to measure background radiation and therefore the readings at the low end of the measurement scale are meaningless. Steuart Campbell proposes an alternative explanation. He agrees with the standard explanation that the incident began with the sighting of a fireball (bolide) which was interpreted by guards at the base as an aircraft falling in flames in the nearby forest. In fact it would have been hundreds of miles away over the North Sea. Campbell argues that the object subsequently seen by Halt and his men on their nocturnal expedition was the lightvessel Shipwash and that the supposed “spacecraft” were actually bright planets, such as Venus. Campbell is critical of the USAF’s abilities with their equipment. Another theory is that the incident was a hoax. The BBC reported that a former US security policeman, Kevin Conde, claimed responsibility for creating strange lights in the forest by driving around in a police vehicle whose lights he had modified. Conde has since withdrawn the claim that he was responsible for the incident. “It is my impression that I pulled my stunt during an exercise. We would not have had an exercise during the Christmas holiday [when the UFO sightings occurred]. That is a strong indication that my stunt is not the source of this specific incident”. However, it remains possible that the coloured lights seen in the forest on the first night of the incident were due to a hoax by a perpetrator who has never come forward. Other explanations for the incident have included a downed Soviet spy satellite or a nuclear incident. Some of the first people to examine the event in detail were the British Ufologist Jenny Randles in her book “Sky Crash”, and Nick Redfern in his books “Cosmic Crashes” and “A Covert Agenda”. Georgina Bruni has researched the subject and in her book You Can’t Tell the People publishes a photograph of the supposed landing site taken on the morning after the first sighting. The late Lord Hill-Norton, (Admiral of the Fleet and former Chief of the Defence Staff of the UK) also believed that a UFO landed at Rendlesham and repeatedly questioned the UK Government on the issue. Larry Warren who was the source of the original News of the World article has written extensively on the subject and is a firm believer in an extraterrestrial explanation. Warren was certainly a USAF airman at the Woodbridge base, but his own claims that he was a witness to the incident are disputed by others, notably by Col. Halt. Bruni and Warren do not, however, agree on the details and have clashed publicly over the supposed inaccuracies of their respective accounts. Prominent amongst the sceptics is Ian Ridpath (mentioned above). Much of his research is available on his website, which also includes much of the raw evidence, including the original eyewitness statements. One of the most prominent believers in the extraterrestrial origin of the Rendlesham UFOs is Nick Pope who worked for the MoD, researching and investigating UFO phenomena between 1991 and 1994. He discussed the Rendlesham Forest Incident in his various books and in his articles: “Selected Documents”, which relates to the MOD documents on the Rendlesham Forest incident, “Rendlesham – The Unresolved Mystery”, “The Rendlesham Files Reviewed” (a detailed commentary and analysis of the MOD documents) and “Rendlesham Forest UFO Incident”. He has gone on record as saying that “the Rendlesham Forest Incident is bigger than Roswell”. Additionally, Lieutenant Colonel (later Colonel) Charles I Halt, the former Deputy Base Commander of USAF Bentwaters and Woodbridge, who was a major witness to these events, is also a firm believer and contributor to books and documentaries. Today, the forest looks quite different: the Great Storm of 1987 (winds equivalent to a category 3 hurricane) caused extensive destruction of trees, and the Forestry Commission undertook a massive replanting programme in its aftermath. However, some of the locations associated with the supposed incident are still identifiable and the Forestry Commission have marked a trail (the UFO Trail) for walkers, which includes the principal locations such as the small clearing where the object allegedly landed. “In December 1980 several sightings of UFOs were reported in Rendlesham Forest. Many think these mysterious events are the most significant UFO incident to have occurred in the UK. “During the evening of 26 December a resident of Sudbourne, a village approximately 6 miles (10 km) to the North East of Rendlesham Forest, reported a mysterious shape (like an upturned mushroom) in the sky above his garden. Later that night two USAF patrolmen at the East Gate of RAF Woodbridge spotted unusual lights in the forest, and were given permission to investigate. What they reported was very strange. “This was the time of the ‘Cold War’ and because of the sensitive military situation at the time, the incident was officially reported to the Military Authorities by the Deputy Base Commander Lt. Colonel Charles Halt, USAF. * MOD Documents covering the UFO incident at Rendlesham Forest in 1980 were first released in May 2001 to Dr. David Clarke of Sheffield University who had requested them under the Code of Practice for Access to Government Information (which preceded the UK’s Freedom of Information Act). Dr Clarke discusses them on his website In 2008 the files were transferred from MoD to The National Archives (TNA) and removed from the MoD website. * As of August 2009, all documents relating to the incident are available on the National Archives UFO section under reference DEFE 24/1948. These documents include the request above, along with details of the Ombudsman judgment which followed. For the next few months, access to this file, and other files released on the same date will be free to view and download. This is a military document that reports a UFO landing near airforce base in England in 1980. They were 3 witness on site that day. A look at the Bentwaters UFO case in the UK of December 1980. The Rendlesham Forest Incident is the name given to a series of reported sightings of unexplained lights and the alleged landing of an extraterrestrial spacecraft in Rendlesham Forest, Suffolk, England in late December 1980. It is perhaps the most famous UFO event to have happened in Britain, ranking amongst the best-known UFO events worldwide. It has been compared to the Roswell UFO incident in the United States and is commonly referred to as “Britain’s Roswell” or the “English Roswell”. Find out more at Rendlesham Forest UFO incident tag! 1978 Know one beleived me when i met a old friend from the stars that travels through the fabric of time in a Triangle space ship .Still know one wants to beleive me may be i make to many spelling mistake,trouble with the world today people say why you not me,world is quick to run people down ,i would not tell lies to the world what i saw was real i my self can’t wait to see my friend from the stars and return to the stars myself with my old friend and another friend. Pity the sound volume is too low to easily listen to.